We take pride in our complete CNC machining and EDM machining processes to achieve superior surface finishes, and minimize inaccuracies created by hand work and the need for polishing. Highly trained machinists cut part data into steel by using a combination of the best available CNC machines, tooling, computer software, hardware and our proven machining techniques. Many variables are taken into account and adjusted during the high speed machining process to improve and refine it daily. Complex molds such as wrap-around lenses, reflectors and housings can be a huge challenge for even the most experienced tool shops. 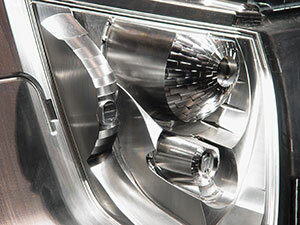 Retractors, slides, lifters and inserts make today’s machining more complex than ever before. We can state with confidence that Platinum Tool is at the leading edge of technology capable of building these types of molds. Needs a Quote? Please contact us and we will respond promptly.